A: PDR is otherwise known as paintless dent repair. This is a process used by technicians to remove small dents from the vehicle without having to use paint or bondo on the vehicle. The technicians apply pressure and leverage to the backside of the panel and massage or work the dents out keeping the very valuable factory paint intact. There is no sanding, or body fillers or painting involved. Q: What size dents can be removed with this process? A: Our ability to remove a dent is determined more by how sharp or how deep it is and where it’s located, rather than how large. As a general rule of thumb – if a dent involved any moving vehicle, it will probably require a conventional body shop because of the excessive stretch and bodyline damage. We specialize in parking lot damage – door dings, golf ball and baseball impacts, as well as hail damage. Q: What if the paint is cracked or chipped? A: What many people perceive as a chip or a scratch is often just an abrasion from what ever had impacted it. These can usually be polished or rubbed out when we remove the dent. If the paint is chipped down to the primer or steel, removing the dimple or dent and applying factory touch up will make for a very acceptable repair, and is much better than repainting the entire panel. A: During the time you are eating lunch, shopping or playing 9 holes of golf, your car can be repaired. Most repairs are completed within 1- 4 hours. Hail damage can usually be fixed within 48 hours. WE PRIDE OURSELVES WITH FAST SAME DAY SERVICE! Q: What advantages does PDR have over traditional body repair methods? A: The number one advantage is that the original factory finish remains in tact. The vehicles value will not diminish because it was damaged and then repaired. Other advantages are quicker repair times, less disassembly, and smaller repair costs. Q: Are holes drilled to access dents? A: We at Dent Clinic take a great deal of pride in our ability to reach most dents with out drilling or “Manufacturing Access”. If however such a procedure is required – rest assured that it will be handled professionally; sealed or plugged and guaranteed not to cause problems. Q: Can a vehicle be repaired more than once using PDR? A: YES. 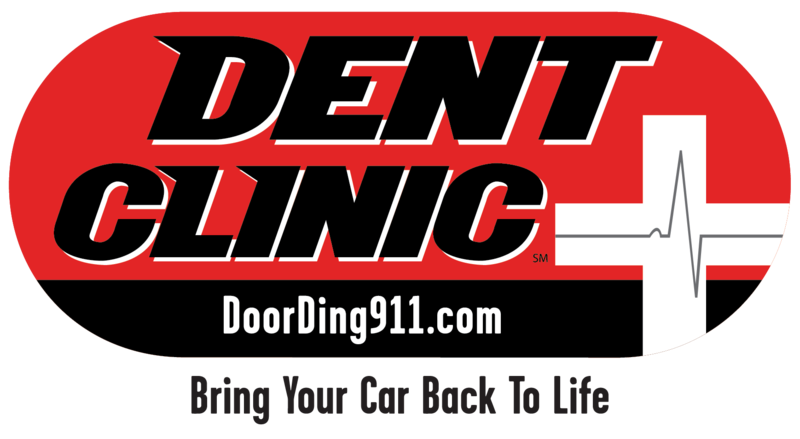 Dent Clinic has repaired numerous vehicles more than once with no problems. Q: Can all panels on the vehicle be accessed? A: There is about 5% of the vehicle that is inaccessible – we need an air gap between panels in order for us to use our tools. Q: How do I know whom to trust to do the PDR work Correctly? A: Use a company who is Insurance approved and offers a written guarantee on the repairs completed to your satisfaction or you won’t have to pay for the repairs.